Hi guys! Fellow blogger Sarah, over at Chalkboard Nails, is hosting a nail art contest! Basically, it's about creating a look using a dotting tool of some kind - whether it be an actual dotting tool, or a tooth pick, or bobby pin. You can see all the rules on her blog! I chose to go with an island/tropical theme. My index finger is supposed to be an ocean curl. I used a polish by Ana Hickman in the color "Rock" for the background. Then, using a dotting tool, I started dotting the water and curl with OPI DS "Sapphire, OPI DS "Glamour", China Glaze "White on White", and China Glaze, "Frosty". On my middle finger I painted the background with Sinful Colors "Cinderella". Then, using a dotting tool, I dotted the sun, using Color Club "Almost Famous" and China Glaze "GR8". On my ring finger I painted the top half with the same "rock" polish as on my index finger, and the bottom half with Rimmel "Steel Grey" and China Glaze "Knotty" over it. Then, using dotting tools I designed the palm tree using quite a few colors including: China Glaze "IX", Kiwi-Cool-ada", "He's Going in Circles", Orly "Meet me Under the Mistletoe", and OPI DS "Desire". 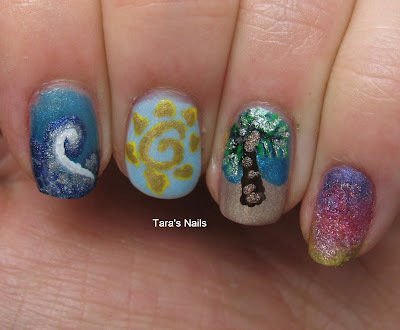 Last, on my pinky finger, I used a dotting tool to create a sunset. These colors include: OPI DS "Original", DS "Signature", China Glaze "How About a Tumble", "IDK", "LOL", "Octa Gone Wild", and "Don't be a Square". eeeeee, im entering too. and im NERVOUS. It makes for a beautiful sea background!! I love it! !